It has been a dismal week. The garden is sodden underfoot and the trees have spent the week dripping folornly. The leaves that fell at the end of October have started to break down. Lying on the brown sludge I found a single scarlet leaf from Acer rubrum, the only one it has ever produced. I looked at the tree with a lumberjack's lack of compassion. I'm not going to take it down but every year that it fails to colour I console myself with the thought that I could. Finally this morning the sun came out and the trees are sparkling with diamonds. They are cold, wet, drippy diamonds but they are cheering for all that. Plants in the greenhouse are preparing for winter. It is cold enough at night for water to condense on all the surfaces and the atmosphere is clammy. There hasn't been enough sun to warm the place up through the day so the lush growth of summer has softened like an over-ripe pear. Sinningia conspicua was late into growth this year. I'm doing something wrong but I don't know what. It will come into the house soon because I don't want to lose it yet. It has shown some cold tolerance but it may need a warm year to pep it up a bit. At the end of August the plant seemed to run out of steam and produced a couple of tiny buds that are only just opening now. When you see plants of any species growing in habitat they often look rather feeble compared with the lush, vigorous specimens we cultivate in gardens. We feed them, water them and keep them weed free and they grow enormous. Unfortunately this one looks as though it would be happier back in Brazil. With cold diamonds dripping on me from the trees, who can blame it. A few flashes of scarlet make a big impact in the garden. Last week I had a poke around in the tangle of Lapageria stems to see if there were any buds to come. I couldn't see any sign and accepted that the season had finished. The plants had suffered a bit during the summer, probably from drought but if it wasn't that it would have been something else. Lapageria are terrible drama queens. They will roll their metaphorical eyes and swoon gloomily whatever conditions you give them. It is as well to remember that they have tough stems like steel wire. They don't ever wilt but they throw themselves to the floor as soon as there is an audience. Last week I didn't find any signs of flower and the last promise of autumn seemed to have faded. Under my breath I suggested that it shouldn't worry, it had tried it's best and (twist the knife) there were plenty of other things that could deliver some seasonal colour. I could wait for another year. This week I have two spectacular flowers. The buds must have been there, but I wasn't taking sufficient interest. The drama queen was listening. Swooning only works if people are paying attention. There are very few plants with clear blue flowers and even fewer that can be relied on to flower in the last weeks of autumn. 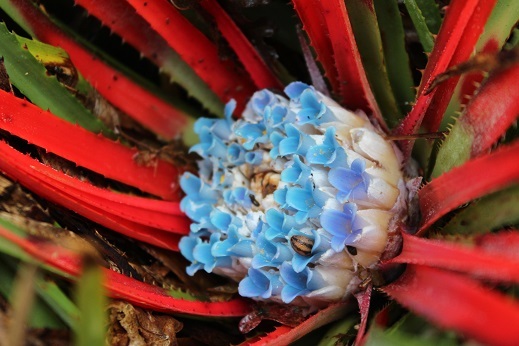 It is quite remarkable that Fascicularia can produce a great boss of blue flowers yet they are completely eclipsed by the scarlet bracts. Like a prickly poinsettia reaching retentive arms out to catch a careless santa. It has been flowering since August, each rosette in turn flushing with red, filling with a lattice of powdery white buds and then bursting with improbability. It is difficult not to be a Fascicularia fan. 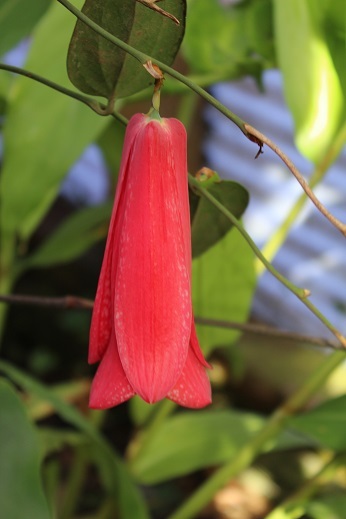 It comes from Chile and it has been suggested that this narrow leaved subspecies occurs inland, sometimes growing as an epiphyte in temperate forests. The broad leaved subspecies, F. bicolor ssp. 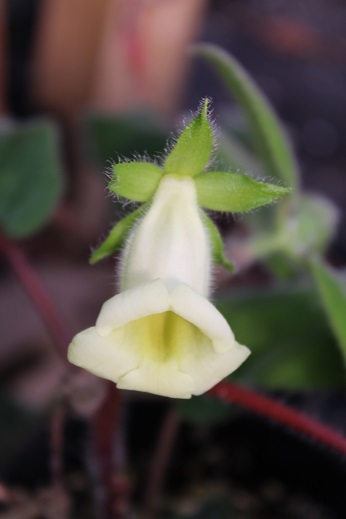 bicolor grows in rocky ground near the coast and may be less hardy in the UK. Certainly in Cornwall it grows best by the coast. The narrow leaved subspecies shown here is much hardier. When I was young it challenged my preconceptions to see it growing lustily in Kent and it introduced me to the unexpected world of (almost) hardy bromeliads. For many years I have treated it as a terrestrial bromeliad and smiled benignly at people who plant it on trees as though all bromeliads were epiphytic. Once again my preconceptions have been challenged on seeing pictures of it growing on trees in Chile. The significant point is finding a tree without leaves because under UK conditions it doesn't really prosper in the shade. I have a stump in mind for a test. 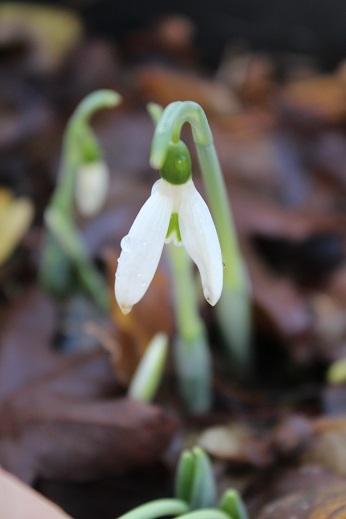 Galanthus nivalis has a strange distribution in the UK. It is not native, so it is found where people have planted it and then left it undisturbed. Graveyards and ancient monuments are common locations but it also appears in seemingly random populations in woods and valleys where there is no obvious sign of habitation, where it looks as though nobody could see it. In the village where I grew up large estates of houses had sprung up around the edge of the town, absorbing paths and trackways into their structure. The charmingly named Love Lane was transformed from a muddy track through thin woodland in the direction of nowhere-in-particular into a busy road to a cricket club. Times had changed and the local youths, filled with (let's call it) romance had to find a new secluded spot to escape the vigilant eyes of their parents. I like to think that a gift of snowdrops between lovers served to mark their turf. Perhaps that is the reason snowdrops are cherished in their seemingly endless variety. To anybody raised among G. nivalis the discovery of G. elwesii is like being hit over the head with a variability hammer (and suddenly I want one of those). Scarcely any two are alike and the differences do not seem to be linked to distribution or habitat. The species is simply variable. Faced with this youthful refusal to conform let us just refer to those that flower before Christmas as the Hiemalis Group, noting that they often have just a single green mark on the inner segments as well. This is an unexpected example found sheltering beneath a fall of leaves. In centuries to come couples will probably stroll hand in hand through car parks deep in the countryside and marvel at the mass of snowdrops surrounding the tarmac. They will return year after year in the spring to enjoy the floral spectacle of Dogger's Dell.